GATE 2018 results have been announced. Indian Institute of Technology (IIT) Roorkee has released the results of Graduate Aptitude Test in Engineering (GATE) 2018 at the official web portal appsgate.iitr.ac.in. The score card will be available shortly for download. GATE, is organised on behalf of Indian Institute of Science (IISc) and Indian Institutes of Technology (IIT). GATE has emerged as one of the major tests for engineering and science aptitude in facilitating admissions for higher education (MTech and PhD) in IITs, IISc and various other Institutes including universities and laboratories across the country. GATE 2018 score card will be available shortly and candidates shall have to download it online only at the GOAPS portal of GATE website. The score card of GATE 2018 is now available. Candidates can download their GATE scorecard 2018 till May 5. The examination authority will not issue hard copies of the scorecards; therefore candidates have to download it within the prescribed dates. Note: In case any candidate requires a soft copy of their GATE Score Card after May 5, they can get it by paying a fee of Rs.500 (five hundred only) on the GOAPS portal till December 31. The results of Graduate Aptitude Test in Engineering (GATE) 2018 examination have been declared on its official website by the Indian Institute of Technology (IIT) Roorkee on Monday (March 27).The test was conducted on February 4, 5, 11 and 12. The answer keys were released on February 27. Candidates can check their results by clicking here and entering their enrolment id. Successful candidates can download the scorecard till May 5, 2018 only. As per the official website, GATE 2018 scorecard download will be enabled shortly. 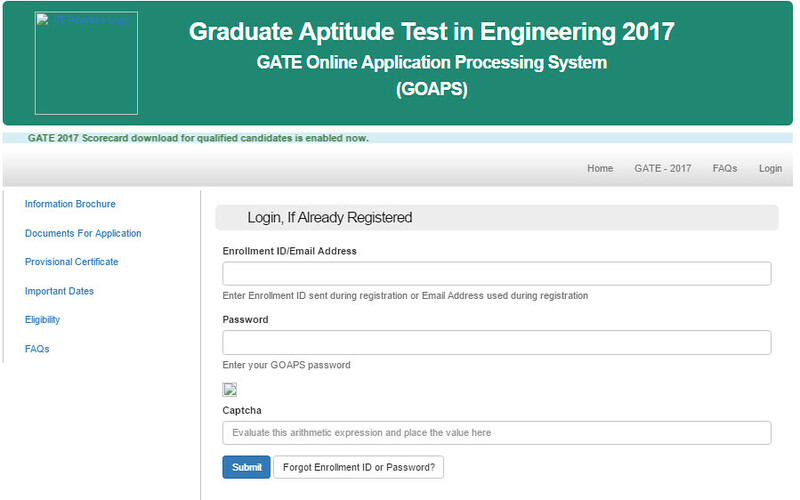 Conducted by the Indian Institute of Science and the IIT, GATE scores are used for admission to MTech/PhD programmes in IITs, IISc and various other institutes. GATE is conducted in 23 disciplines of engineering and science subjects and identifies the candidate’s understanding of a subject and aptitude and eligibility for higher studies. GATE scores are also used as a criterion for recruitment in government organisations such as cabinet secretariat, and national and state public sector undertakings in India. Many GATE qualified candidates are paid scholarships or assistantship, especially funded by the ministry of human resources development and by other ministries. Cut off marks vary each year depending on various factors like number of candidates appeared, the number of marks obtained by the candidates or the difficulty level of the examination. If the difficulty level of examination is low and overall performance of candidates is high, then cut-off will be more but, if the difficulty level of examination is high and overall performance of candidates is lower then it will definitely hit the cut-off marks. The cutoff score of GATE 2018 is the minimum marks that must be secured by candidates to qualify the entrance exam. GATE cut off score is meant to delimit the number of candidates and to select only those who have secured qualifying marks as per their category. Based on the GATE cut off 2018, various PSUs, as well as IITs, NIITs & CFITs select candidates for jobs or academic programmes. Last year, a total of 8,18,850 candidates appeared, out of which as many as 1,35,392 candidates qualified the national level exam. The table below shows previous year’s GATE cut off Score for popular papers. GATE cut off for IITs: GATE score will be basis for selecting candidates for M.Tech admission in IITs. Candidates who wish to pursue master of technology from IITs can check GATE cut off for M. Tech admission in IITs from the table given below. The table below shows cut off for popular branches and institute. The result of GATE 2018 has been declared on March 26, 2018. The GATE result 2018 has been announced for only those candidates, who have score equal to or more than the specified qualifying marks as per their category. Each subject of GATE 2018 will have different qualifying marks. Candidates can check their GATE 2018 result in online mode only. The score will be valid for three years.